Not good Experance We were woke up by nosy people at 3 in morning We only warm water in bath shower We complained matsncevman come said he would increase temp but it remained effectively cold! Friendly staff, excellent location close to the lake and food joints. Rotorua okay place to stay - we were only there at night. No shampoo etc the first night but did the second. Bed spread had burn holes in it. Its tired Its an okay place to stay as a stop over - bar was good and staff helpful. Great spot to stay, lovely meal at restaurant. Unfortunately an unpredictable shower and took a while to drain away. 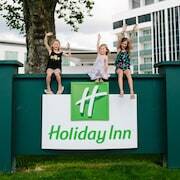 generally satisfactory for our needs, an overnight stay. 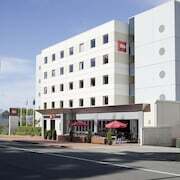 Heading to Rotorua and need a place to crash? 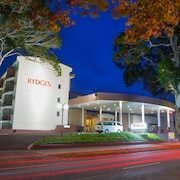 Reserve some insanely good-looking hotel rates on lastminute.com.au. If our deals were on a dating app, you'd be swiping right on every one of them! With a whopping 76 hotels within 2 kilometres of the CBD, the biggest problem you'll face will be choosing one. Dodge that FOMO feeling and take a look at the digs at the Regent of Rotorua and the Regal Palms Resort. Both hotels are smack-bang in the middle of Rotorua. The Wylie Court and the Silver Fern Accommodation & Spa are also well worth a look in. You'll find 26 accommodation options in the well-known neighbourhood of Fenton Street, just 0.8 kilometres from the main streets of town. 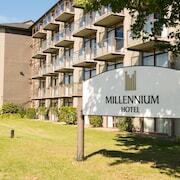 The Tuscany Villas Rotorua - Heritage Collection and ASURE Palm Court Rotorua boast some awesome facilities. Get the blood flowing with a trek through Haiku Pathway. Need somewhere to crash close by? No probs, we've got your back. 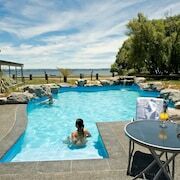 Wai Ora Lakeside Spa Resort and Sudima Lake Rotorua are practically on the doorstep! Visit Redwoods Whakarewarewa Forest and enjoy the beautiful trees and woody scent of the forest. Lakeside City Apartments and Princes Gate Hotel are two suitable accomodation options if you don't fancy staying far away. Wasting all your holiday savings on flashy accomodation usually means less cash for the fun stuff. 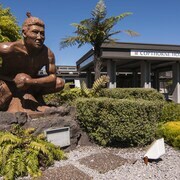 Why not have a look at the legit deals at Base Rotorua - Hostel, Rock Solid Backpackers Rotorua and Rotorua Citizens Club? You might also like to check out the Solitaire Lodge or the Treetops Lodge & Estate. 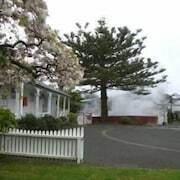 The Solitaire Lodge is 13 kilometres away from central Rotorua, and the Treetops Lodge & Estate is 11 kilometres away. We'd also suggest the Peppers On The Point - Lake Rotorua and the Koura Lodge. The first is 4 kilometres away from the center, while the second is 4 kilometres away. If you still have itchy feet, why not take off and see more of the Bay of Plenty region? Art museums and nature museums are some popular places that should be on your must-do list. If the outdoors are more your thing, explore Rotorua's beaches and coastal plains. Eager for more? Popular activities in this corner of New Zealand include mountain biking, mountain climbing and hiking, so don't be afraid to have a crack! Looking for things to do? Consider spending some time discovering the Aratiatia Rapids and the Prawn Farm. You'll find them in Wairakei, 55 kilometres to the south of Rotorua. 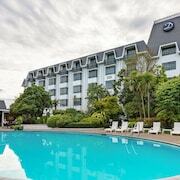 The Wairakei Resort Taupo and Falls Chateau are some of the great hotel options here. 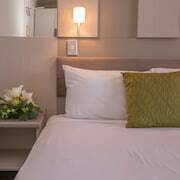 Alternatively, you could stay in Taupo, 65 kilometres to the south of Rotorua, where you'll find the Sacred Waters and Voyager Apartments Taupo. Taupo Hot Springs and A.C. Baths are up there with the most popular sites to explore when visiting Taupo. After sleeping upright for hours, a warm cosy bed at the All Seasons Holiday Park will be bliss! If it's chockers there, have a gander at the Holdens Bay Holiday Park. Both are pretty much on the doorstep of Rotorua Regional Airport, which is 7 kilometres from Rotorua's centre.